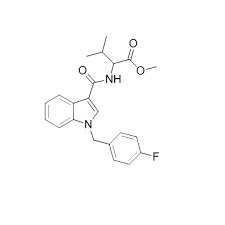 FUB-AMB is a synthetic cannabinoid that is also a new research chemical with an IUPAC name of (S)-methyl 2-(1-(4-fluorobenzyl)-1H-indazole-3-carboxamido)-3-methylbutanoate and a molecular weight of 383.16. The chemical formula for FUB-AMB is C21H22FN3O3. FUB-AMB is an analogue of AB-FUBINACA, a potent synthetic cannabinoid first synthesized by Pfizer. AB-FUBINACA exhibits a strong affinity (Ki =0.9 nM) for the CB1 receptor. The primary amide moiety in the L-valinamide side chain in AB-FUBINACA is replaced with a methyl ester in FUB-AMB. FUB-AMB was identified by Louisiana crime labs in an herbal mixture labelled “Train Wreck2” in 2014 and was banned as a controlled dangerous substance as of July 3rd, 2014. The physiological and toxicological properties of this compound are not known.